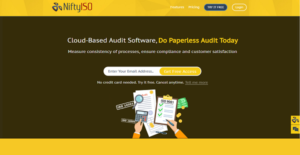 Nifty5S is an audit management software designed to help auditors streamline the entire auditing process and increase their efficiency and effectiveness using the 5S methodology – sorting, straightening, systematic cleaning, standardizing, and sustaining. Auditors perform the audit via their smartphone, tablet, or the web, ticking checklist for each of the ‘S’. With Nifty5S, auditors no longer have to burden themselves with complicated auditing steps. The platform allows them to create custom templates per each of the ‘S’ and then modify or reuse the templates for future auditing. Questions can be edited and items on the checklist can be removed or added per user requirements. As the audits are done digitally, it eliminates the use of pen and paper as well as the waste that comes with it. Nifty5S can be utilized offline. Once the audit is done, the results are automatically synced with a cloud database and can be easily shared with other members of the team. Nifty5S provides you with a cloud-based data storage where all your audit results are securely stored. Every data from your audits are instantly entered into the centralized database. When you are offline, the data are automatically synchronized once you reconnect to the Internet. With Nifty5S, you and your auditing team perform audits using your smartphone, tablet, or your desktop (via web browser). All audits are digital and automatically synchronized with your cloud data hub. You no longer have to print out, use, and store tons of audit checklists or work with pens. This means All waste associated with the pen-and-paper approach is taken out of the equation. You and your auditing team become more efficient with your tasks, but you also save a great deal of money, time, and resources. The 5S Methodology is a widely used approach by auditing and accounting firms, manufacturers, retail businesses, and more because it is highly efficient and effective. Nifty5S combines the 5S methodology with modern technology to provide you with a better, more streamlined way to perform all sorts of audits. You breeze through checklists after checklists full of confidence knowing you have all bases covered. What Problems Will Nifty5S Solve? Simple 5s checklist view for ease in audit. Checklist questions can be modified. 5s Admin panel provides branding options: Logo selection, template, customized 5s questionnaire. All audit data are secured and backed up on cloud database. Since each enterprise has specific business needs, it is sensible for them to refrain from searching for a one-size-fits-all perfect software application. Needless to say, it would be useless to try to find such a system even among market-leading software applications. The smart thing to do would be to jot down the various important aspects that need consideration such as required features, finances, skill levels of workers, company size etc. Then, you should do your groundwork thoroughly. Read some Nifty5S reviews and check out each of the other systems in your shortlist in detail. Such exhaustive homework can make certain you discard ill-fitting applications and choose the app that provides all the features you need for business success. How Much Does Nifty5S Cost? We realize that when you make a decision to buy Accounting Software it’s important not only to see how experts evaluate it in their reviews, but also to find out if the real people and companies that buy it are actually satisfied with the product. That’s why we’ve created our behavior-based Customer Satisfaction Algorithm™ that gathers customer reviews, comments and Nifty5S reviews across a wide range of social media sites. The data is then presented in an easy to digest form showing how many people had positive and negative experience with Nifty5S. With that information at hand you should be equipped to make an informed buying decision that you won’t regret. What are Nifty5S pricing details? What integrations are available for Nifty5S?